Winners of the UFU Winter Barley competition this year is Boyd Kane. Pictured in the winning field is: Kathryn Taylor and David Oliver, North West Derry Group, and winners Alex and Boyd Kane. 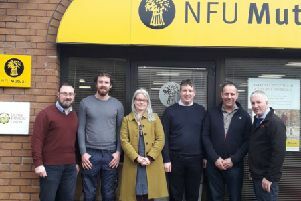 The Ulster Farmers’ Union, along with Winter Barley competition sponsors Mortons and Bayer Crop Science, is pleased to announce that Boyd Kane, of the UFU North West Derry Group, has been awarded first place in the 2018 UFU Winter Barley Cereal Competition. Second place this year was awarded to Jonny Hamilton, from South Londonderry, and scooping up a respectable third place was Morris Peden, from Ballymoney. Commenting on winning this year’s competition, Mr Kane said: “I am delighted to have won the UFU Winter Barley Competition. When I was sowing the crop in mid-October the wet conditions we were experiencing made sowing and growing conditions more difficult, however I am pleased that the ‘Tower’ variety has done well, and with the recent spell of good weather it is going to allow harvest to take place in the next few weeks. The awards for the Winter Barley, Oats, Winter Wheat and Spring Barley cereal competition categories will be officially presented at the 2018 UFU and sponsors Cereals Competition Awards and lunch planned for later this year.